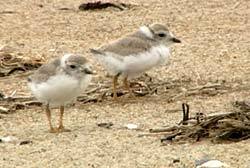 Piping plovers are legally protected in New Hampshire. Possession and take (which includes harming, harassing, injuring and killing) is illegal. Description: 6-7 ½” Sand color on top and white underneath. A black ring around the neck varies in thickness and may be complete (on males) or incomplete (on females). Legs yellow. Bill yellow or orange with a black tip. Commonly Confused Species: Semipalmated plovers are similar in size however they are darker on top. Semipalmated plovers are frequently seenon beaches in large flocks whereas piping plovers are territorial and monogamous during the breeding season with only one male and one female per breeding area on sandy beaches and dunes. Killdeer are approximately double the size of piping plovers and have two black bands around their neck instead of one. Killdeer are commonly seen in grassy areas and parking lots away from the immediate coast whereas piping plovers are almost always found on beaches and sandy dunes. Habitat: Piping plovers nest on coastal beaches above the high tide line, sandflats at the ends of sandspits and barrier islands, gently sloping foredunes, blowout ar­eas behind primary dunes, sparsely vegetated dunes, and washover areas cut into or between dunes. Feed­ing areas include intertidal portions of ocean beaches, washover areas, mudflats, sandflats, wrack lines, and shorelines of coastal ponds, lagoons, or salt marshes. 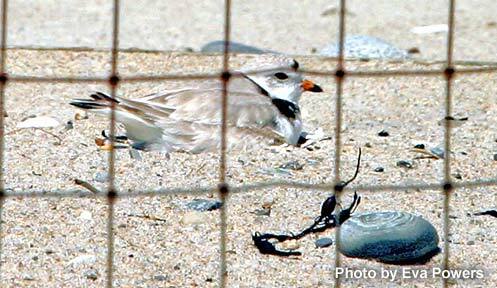 Life History: Piping plover nests are simple scrapes in the sand that may contain pieces of broken shell fragments. 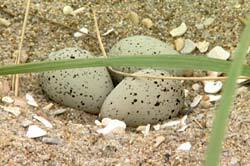 Piping plovers lay up to four eggs in one nest each year. Both the male and female take turns incubating the eggs and both parents help watch over the young chicks after hatching. Chicks are precocial at birth meaning they have feathers and can walk and feed themselves within hours of hatching. Chicks are considered fledged at approximately 25 days of age when they can first fly. Adults may re-nest a second time in the same breeding season if the initial nest attempt fails. Three nesting attempts in one breeding season have occasionally been documented as well. 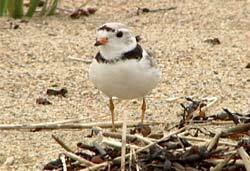 Piping plovers forage for marine worms, crustaceans and insects in the sand and in the wrack (seaweed) that wash ashore. 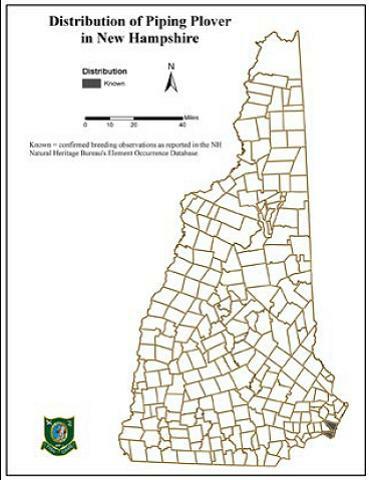 Distribution Map: View a map showing the towns where this species is reported to occur in NH.